LPUNEST 2019 : Lovely Professional University (LPU) is one of India’s Top Private University. LPU was established in Jalandhar Punjab, 2005. Lovely Professional University National Entrance Scholarship Test is an annual state-level exam organized by the Lovely Professional University since 2009. 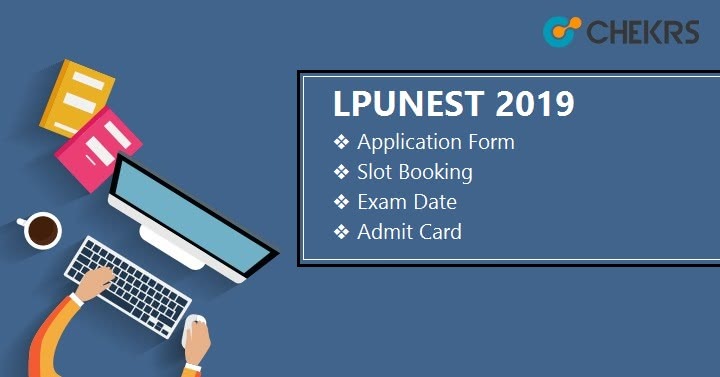 Latest Update: LPUNEST 2019 Application Form is available online. Check Procedure and last Date below. Latest Update: Schedule for LPUNEST 2019 (all Programme) has been released!! Check the Table Below. Lovely Professional University offers admission in various courses like Engineering, Management, Law, Agriculture, Design, etc. Those who seek LPU Admission in these programs will have to appear in the exam.This test also provides various scholarships (For Deserving Applicants) for the different courses based on some terms and norms made by the University itself. For all the information please check our full report. Admission process will start in the upcoming month. LPU will announce the LPUNEST schedule regarding admission procedure in various UG & PG course. Candidate can check the tentative dates of LPUNEST Admission Date for individual courses. LPUNEST Eligibility Criteria are prescribed by LPU official authority for the different course. Candidate must ensure the eligibility of LPUNEST before applying for the form or at the time of admission. The Applicant must have passed qualifying exam with Physics, Mathematics and English as compulsory subjects. The applicant has done 10+2 from the recognized boards like CBSE, ICSC, RBSC, etc. The Minimum 60% Aggregate is required with sectional 50% aggregate in each subject. The Applicant has passed 12th Class from the recognized board i.e. CBSE, ICSE, RBSE, etc. Applicant must have English as the compulsory Subject. The Applicant must have the minimum 60% aggregate to qualify for the LPU NEST 2019 with 50% Aggregate in each subject. The candidate must have completed a bachelor degree (3 years or 4years) from the recognized University or College or Institute. The candidate has passed the degree with a minimum of 50% Aggregate with the equivalent subjects. The candidate should pass in each subject no backlogs. The applicant with backlogs is not eligible for the LPU NEST 2019. LPU NEST Application Form will be available in the month of October. Applicants can fill and submit the application form through both online and offline mode. For offline, Students have to collect the form from the LPU University, Fill it and then submit it to the campus. Then go the Admission section find the Application link. Click on it to apply for ‘LPU NEST 2019 Application Form’. In starting, you have to enter the Basic details like Name, Date of Birth, Email-Id, Mobile Number. This will help you to create an account on LPU portal with unique Id and password. Once you created the account, just login in it. After login, start filling the form with Personal details, Education Details, Upload recent size photo with specific dimensions, signature, required mark sheets, passing certificate, etc. Now go to the payment mode which online. You have to pay the fees through Net Banking/ Credit Cards /Debit Cards. Also through DD (Demanded Draft) in favor of Lovely Professional University payable at Jalandhar, Punjab. Once you have done with payment, cross verify every detail before final submission. Don’t forget to take the print out of LPUNEST Application Form and also the fee receipt for the future reference. Once finished the application, wait for few weeks to open Slot booking. In Slot Booking system you have to log in again with your Ids and password. After login just books the Date, Time and Test centers according to your convenience. Once you are done with LPUNEST Slot Booking, take the print out of it. LPUNEST 2019 Syllabus will be prescribed by exam board authority of LPU. It will be available on the official website of University. Candidate can check the syllabus according to their choice of course. Syllabus for B-Tech will have general topics from following Subjects-Physics, Chemistry, Mathematics or Biology. Syllabus for MBA will have general topics from following Subjects- General Aptitude, General awareness and English. Syllabus from LAW will have general topics English, Logical & Quantitative and Legal Reasoning. Divide your Syllabus into easy, hard, Medium. Give more time to hard, least time easy topic. Speed and Accuracy will help you to get good rank and high scores. Eat and drink Healthy to stay fit. Don’t stress yourself out use 5 minutes break as a stress buster. Sample papers are available on official as well on the other sites on the Internet. LPU Sample Papers 2019 will help you to improve your examination skills as well as cover the entire syllabus. Some topics are not available in the book they are available in Sample papers. Online Mock Test will help you with the accuracy and speed and to know where you stand before the exam. Admit card will be available on the official website. You have to log in to your account to download it. Once you download it take the print out of LPUNEST Admit Card. It will be available just 15 days before the exam. The Answer Key will be available after 5 or 6 days of examination. Candidates can match their answer with the published LPUNEST Answer Key and estimate their chances of getting admission in LPU. LPUNEST Result will out within one week of the examination date. You can see your result by login into your account on the official portal. Candidate must remember their UserId & password to access their account and download the result. Enter the required details to download the LPUNEST Merit List. The counseling date will be finalized after the result and merit list. Once the LPU NEST Counseling is done the provisional seat allotment letter will be given on the basis of Seat availability, Rank, and category. After the LPUNEST Seat Allotment Candidates have to report to the allotted colleges and where they have to verify their Documents and certificates. After successful verification, they will get admission in the preferred course.